Land Rover Bumper Winner Vision Des Flos (Lot 20) was the star attraction at a record breaking Punchestown Sale, providing a superb top lot of €270,000. Significant statistical increases across the board, including a 57% rise in median and 50% rise in average, as well as 9 lots achieving six figures are clear indicators of the growing strength of the Goffs Punchestown Sale. This sale the has produced some top class winners since inception with the likes of the unbeaten Getabird, Grade 1 performer Charbel and yesterday’s impressive Grade 1 winner Champagne Classic. Top lot Vision Des Flos was an exciting winner of the Land Rover Bumper at the Punchestown Festival on Tuesday for Robert Tyner and was this evening sold to Tom Malone for €270,000. 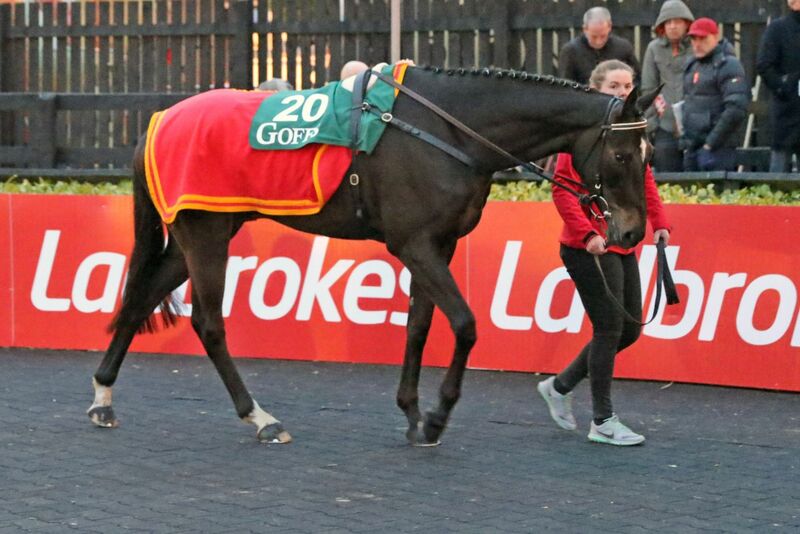 The 4 year old gelding by Balko is now a dual Goffs graduate having been purchased in last year’s Land Rover Sale by Pauric O’Connor from Oak Tree Farm for €25,000. Minutestomidnight (Lot 15), was the impressive winner of the Grade 3 Weatherbys Mares Bumper at Punchestown on Wednesday for trainer Jonathan Sweeney, maintaining her unbeaten record, and was sold for €200,000 to Coldunell Ltd.
Trainer in form Jessica Harrington was the purchaser of Not Many Left (Lot 9) for €150,000 from Colin Bowe’s Milestone Stables. The son of Oscar looked a smart prospect when winning the 4 year old maiden at Largy last weekend. Michael Buckley succeeded in acquiring Burrows Edge (Lot 17) for €140,000 from Bernice Stables, this gelding by Martaline was another eye-catching Point to Point maiden winner in the last seven days. Leading purchaser Tom Malone’s other purchases included Lot 16, Senor Lombardy, a notable winner of a 5 year old maiden at Fairyhouse last weekend, while David Minton of Highflyer Bloodstock was also busy purchasing 3 lots. “There is no doubt that this year’s catalogue was the measure of any, with over half the catalogue having produced their form within the last week. That led to a superb trade and a record number of 6 figure transactions and huge gains in every statistic, headed by an impressive 88% clearance rate.